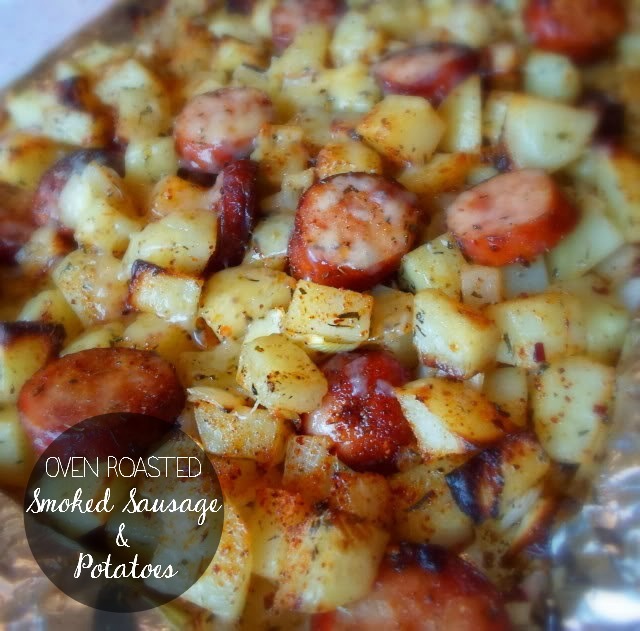 Smoked Sausage and Potatoes is a family favorite and is a meal that my family loves to have with green beans and squash. Several months ago when making this meal, I would fry the sausage and potatoes in olive oil, which is also delicious. Since I serve this meal with fried squash, I didn’t want to serve two food items in the same meal that are fried so I found this recipe tucked away in a recipe book. Preheat the oven to 400*F. Line a large baking tray (with sides) with several sheets of foil, and spray with cooking spray. Set aside. Put the sausage rounds, onions, and potatoes into a large bowl. Drizzle with a couple tablespoons of olive oil and season to taste with salt, pepper, paprika and dried thyme. Toss together with your hands until everything is evenly distributed. Pour this out onto the baking tray, and spread it out as much as you can. Place into the preheated oven and roast for 45 minutes to an hour, stirring every 20 minutes or so, until the potatoes are golden brown and tender. Turn off the oven. Spread the cheese over top of the cooked meat and potatoes and put back in oven until cheese has melted.